Let’s face this; one of the most challenging aspects of riding a geared motorcycle is shifting gears the right way it was designed to. Many think this as an immensely confusing activity that they switch to gearless scooters to make their life easier. But the actual fact is, with a bit of knowledge about the inter dependency of throttle, clutch and gear and a bit of practice, Perfect Gear Shifting can easily be mastered. Based on a few requests from our readers, here we present to you an easy article on shifting motorcycle gears. This article is aimed majorly at people who are at the initial stages of their motorcycling life or are learning the basics of geared motorcycles. Gear Shifter – As the name says, used to select and shift to the gear of choice. The Basic principle in using the Throttle, Clutch and Gear selector is; Pull the clutch towards you, engage the gear which in standstill position should be the first gear, open the throttle slowly while releasing the clutch in parallel. This makes the bike move forward swiftly. Any mistakes in this procedure, like excess throttle or accidental clutch engagement would result in stalling or even accidental wheelies which are not so good for beginners and are scary at times. So, practice this and get on a swift take-off. As the above said procedure is for beginners; we shall see what it takes to master the technique. A typical gear pattern in a motorcycle that is available on the gear shifter is given below for reference. The same would also be imprinted by almost all the manufacturers either in the fuel tank lid or near the gear shifter indicating particular bike’s gear pattern for easy understanding. Although these steps look more of a detailed lesson with points listed one by one, in practical it is easy to master if done so. The same requires patience and practice. Along with practice one needs to have a feel of his/ her bike to know things better which is otherwise known as communicating with the bike. Now Mastered. When do I shift remaining gears? There’s no proper equation to shift at optimum points apart from the feel that one has for the bike and the Rev Limiter lights kicking in. In most cases of road bikes, revving high until the Rev limiter kicks in and shifting to the next gear is not required as after a certain point the engine doesn’t generate any usable power. Revving the bike even after that would result in damaging the internals on the long run. The trick is to learn the engine’s sweet spot which is the optimum shift point that produces maximum power and torque at a given acceleration point the bike is subjected to. Again going by the above concept, a lot of people try shifting way too early fearing late shifts may damage the engine. Again, by shifting early even before the bike reaches its sweet spot or the defined power band, either the bike stalls or struggles to pull when gradually building the rpms to the selected gear. So, a correct shifting of gear in the right sweet spot will enhance the shifting pleasure, adds engine life and proves out to be more efficient. Almost everyone would have experienced first hand in shifting gears pretty hard that gives a thunderous snapping noise. But how does one shift smooth? The answer is to pay sincere attention to find out the bike’s behavior while shifting. If the bike jerks or if the front fork dives in or dives out excessively, be informed that disengaging and engaging the clutch is not smooth and attention should be paid in sorting out that. On the other hand if the bike spurges ahead with handlebars closing the chest while shifting, then one must realize that too much of throttle is in place that gives these wheelie effects. In short, smooth shifting is all about paying attention and synchronizing the clutch, throttle and gear shifter in one single line. The most difficult part in a geared motorcycle is finding the correct Neutral position. 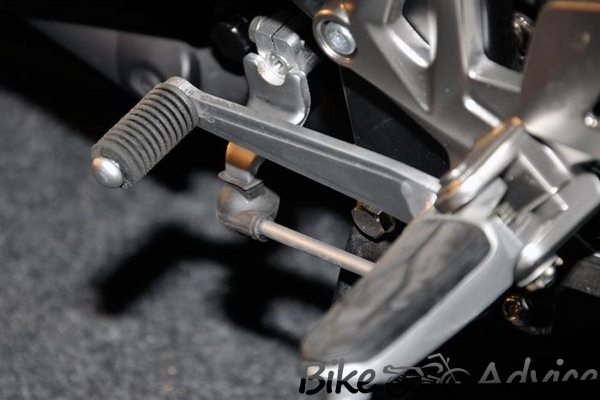 The easiest way to get the bike to neutral is to pull the clutch in when the bike is in 2’nd gear and shift down towards the first gear gently so that the shifter slots in to the Neutral. This can be confirmed by the Green Light indication that instantly lights up once slotted into Neutral. Be careful to not to apply too much of force that might result in the bike to go into 1’st gear which is very common. Although finding “Neutral” might take a little extra effort, with practice it would soon become child’s play. Ever wondered how come the Yamaha RX owners shift to Neutral perfectly every time when we struggle doing the same even once? It’s Practice that they’ve mastered it. The proper way to down shift is to do it as you accelerate; also known as throttle blipping in biking terms. To downshift; Select the lower gear with clutch closed for that moment and let out the clutch while opening the throttle as much as required only. Be careful in not to stall the bike and also never brake while clutch pulled in. Braking in gear with clutch open will help in a bit of engine braking that gives control over the bike, gear positions and also gives rider the option of accelerating quicker if the scenario in front of the bike changes. It is completely Ok to leave the bike in Neutral while parking on a flat surface rather than leaving it on gear, as accidental cranking of engine with gear engaged will pop the bike. When parking in an incline surface, leaving it in the first gear position is the best practice which doesn’t allow the bike to roll off from its kick stand. In a nutshell, it takes time to get accustomed to the correct procedure of shifting, downshifting and finding neutral. But with religious practice one can easily master the most efficient way to extract the max out of any bike leaving the gearless scooters behind.